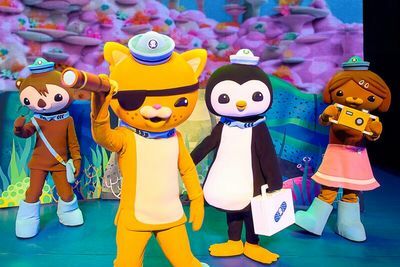 There's something very likable about the Octonauts - whether it's the cuteness and charm, or something deeper, like the mutual kindness or tenacity displayed. Either way, the core values espoused are commendable. Octonauts has always been a favorite around here, as my kids have always enjoyed it. And being the 2nd most watched kids TV show in Australia, it's obviously got a lot going for it. But can I just add, any program that mitigates hooting and howling, soft-toy throwing, bouncing/climbing/sprinting on couches is also a favorite of mine. Australian family theatre producers Life Like Touring are proud to present 'OCTONAUTS LIVE! OPERATION REEF SHIELD'. Developed from the TV program, this all-new live stage production will delight. Written and directed by Theresa Borg, fresh out from her acclaimed international production 'Scooby-Doo Live! Musical Mysteries' and 'Sesame Street Presents Elmo’s World Tour', this latest feat has already proven itself. Theresa, a successful director/writer, theatre performer, and opera singer, recently commented “We’ve been thrilled and humbled by Australia’s response to this show. We really pushed ourselves creatively and theatrically to create a uniquely special live experience for children to enter the world of these wonderful underwater adventurers who protect the world’s marine life”. 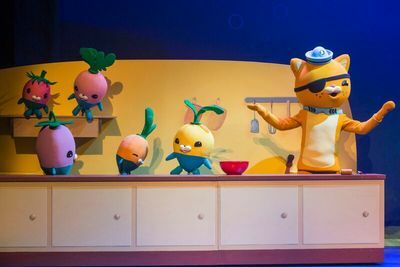 This production sees the starlets from the ABC TV Octonauts program jumbo-sized into impressive life-sized characters. Brimming with interactive and educational fun, special effects, grand musical numbers, puppets-galore, 11 song & dance numbers, and 4 underwater locations, this onstage production has it all. But, given it's based on research undertaken on the Great Barrier Reef, it also employs an authentic context.